Chris contemplates the next obstacle. 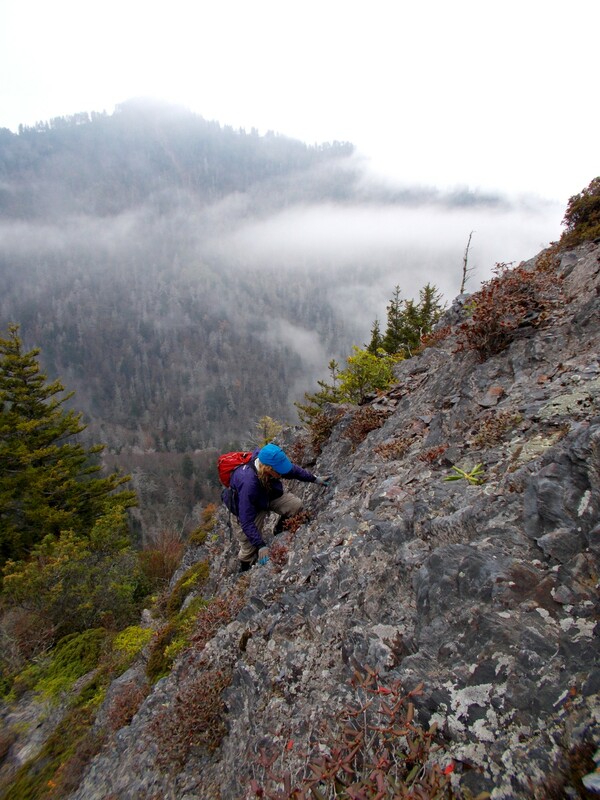 I had climbed the Bunion before…way back in 1983. My bragging rights had long since expired. Perhaps I had become too wimpy over the years to do it again. I thought it conceivable that I would run away in fear. 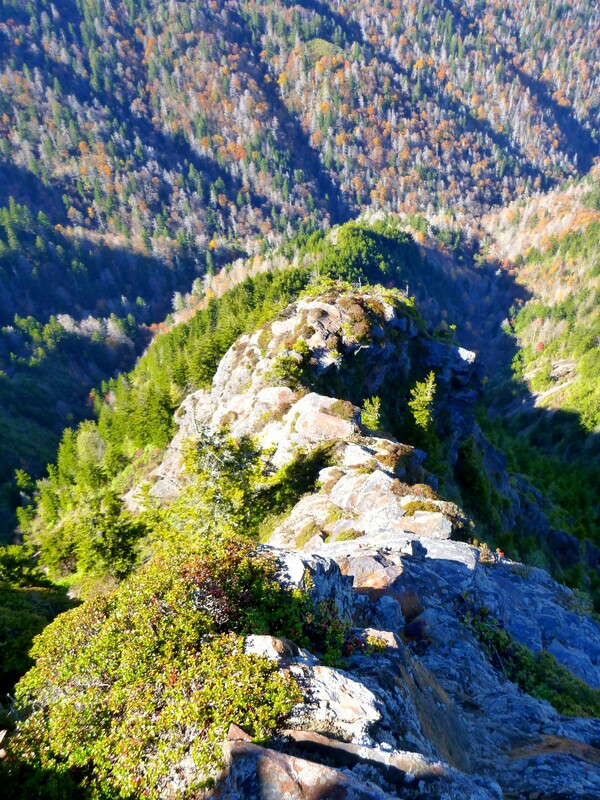 The Bunion—it’s called variously Charlie’s Bunion, the Tourist Bunion, or Bunion Crag. I have now adopted the names invented by a certain genius of nomenclature: Bunion Crag, Middle Crag (just to the east), and Rocky Crag (to the east of that). 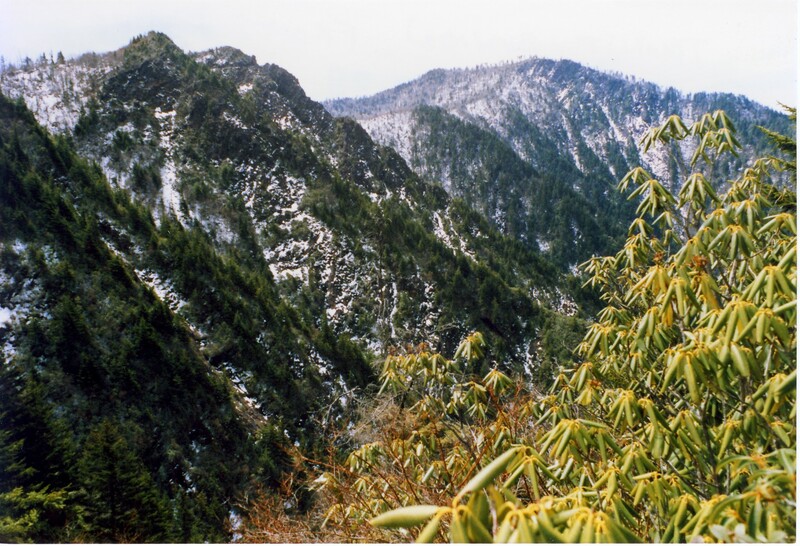 The photo below, taken from the tourist overlook, shows Middle and Rocky Crags. The rock in the lower left corner is part of the tourist overlook. The next ridge over is Middle Crag, and the ridge past that with the hump on it is Rocky Crag. Looking the other way, from Rocky Crag: Middle Crag, then Bunion Crag. Obviously, you can tell from the seasons that both photos were taken on other days. 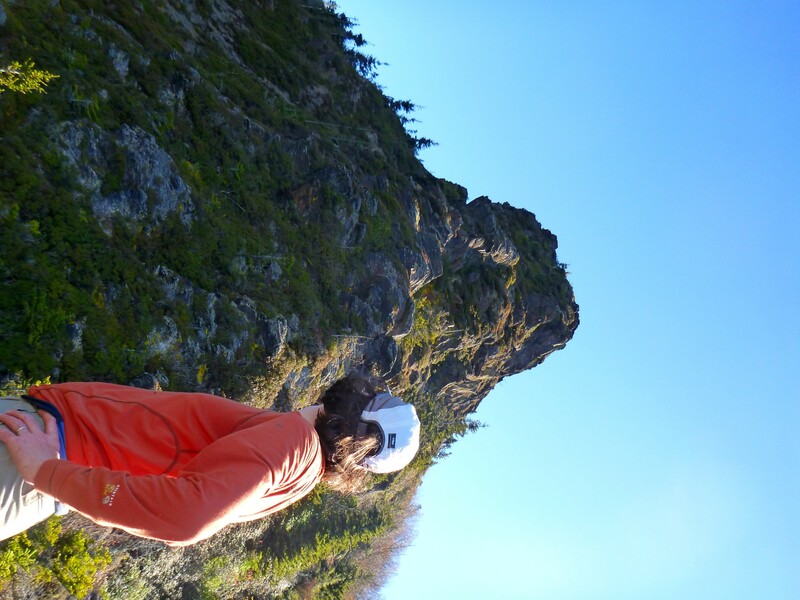 My good hiking buddy Chris Sass had been wanting to do Bunion Crag for a while. 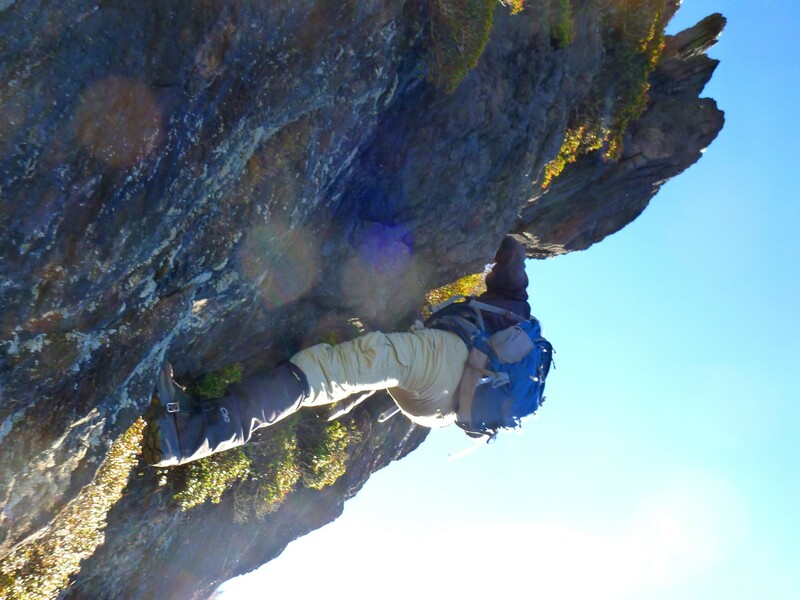 And as readers of this blog know, I’ve had unsuccessful experiences with Middle Crag this year. Chris came up with a plan: we’d go down Middle, come back up Bunion. 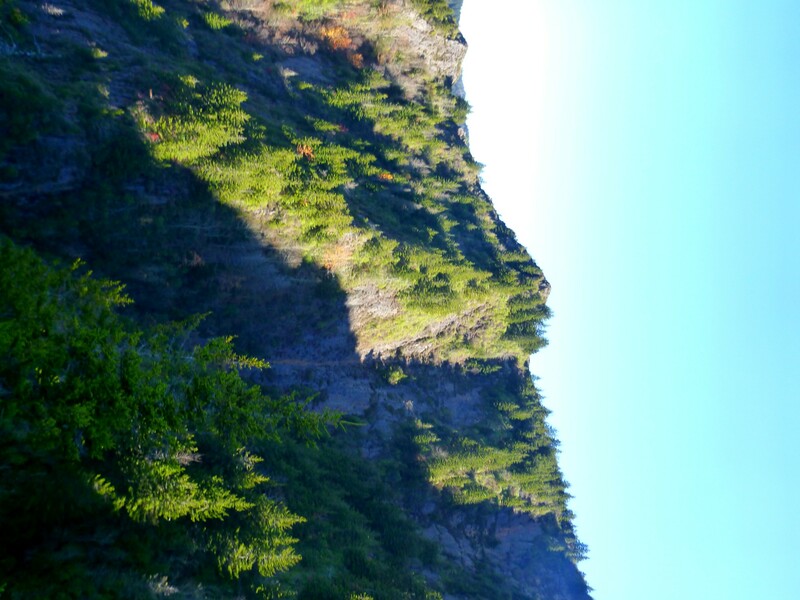 We set off from Newfound Gap amidst throngs of tourists and made it to the tourist sidetrail quickly. At my request, however, we did not make the short side trip to the overlook. I had two reasons: first, I wanted to save that view for last, and secondly, I knew that from the overlook the climb looks impossible, and I didn’t want to set that image into my mind. 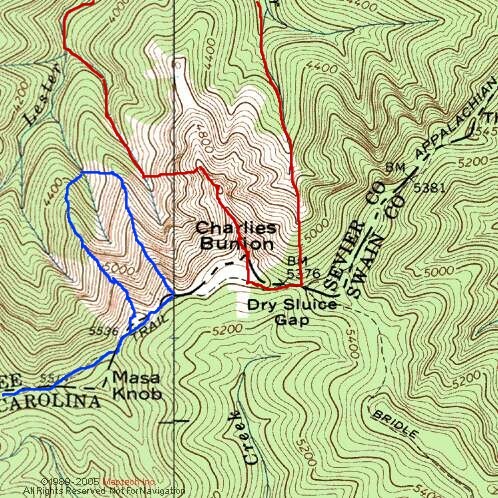 So we walked just past the overlook to the place where Middle Crag joins the stateline ridge and headed down. Oddly enough, it was not far along, in the very upper sections, that I found myself doing my only whimpering of the trip. Upper Middle boasts a series of short bluffs. Coming down from the top, it is quite hard to determine what is solid ground and what is a cushion of myrtle or spruce hanging out over the dropoffs on both sides—and it also requires more dexterity to downclimb the Anakeesta slabs than to upclimb. I said to Chris in a voice that must have showed my fear, “Maybe we should try a different route.” He suggested going a bit further, and I agreed to that, and before long I knew I could do it. But if you try this, do be careful! One of the short bluffs on Middle Crag. Much of Middle Crag consists of tunnels like this. Outlook from swathes of myrtle on Middle. We had great views over to the gullies of Rocky Crag. At 4400′ we started angling down to the draw between Middle and Bunion. 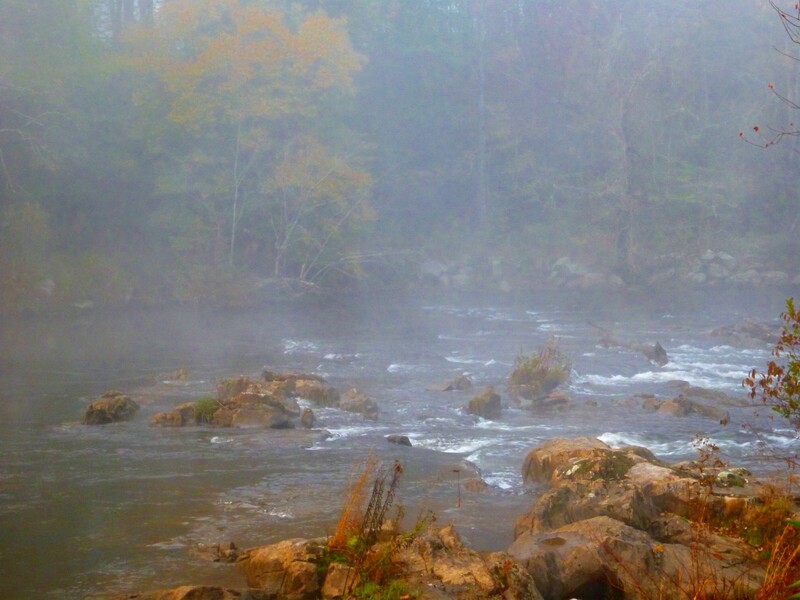 We hit the stream exactly at the boulder called Harrell’s Rock, named for our fearless companion, who unfortunately could not be with us this day. He has done the Bunion upwards and downwards, backwards and forwards. After taking a break, we made the stiff climb up to the ridgecrest. I had told Chris that when I’d done the Bunion years back, we had gone too far up the draw and ended up climbing on uncomfortably steep Anakeesta which, due to the grain of the rock, felt insecure. So we left the stream at 4200′ rather than around 4500′ as on the earlier trip. 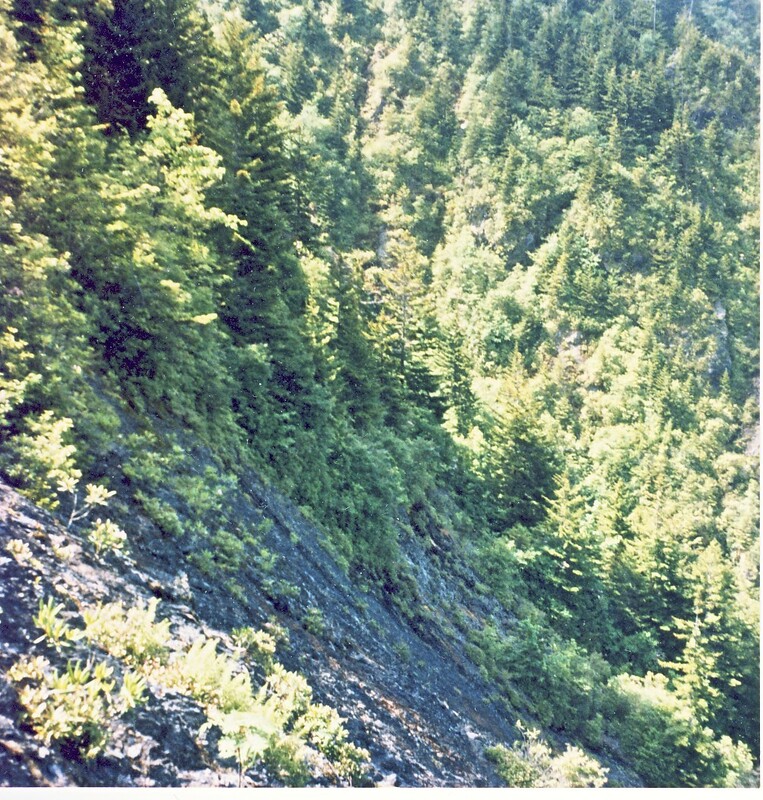 Approach to the ridge taken on 1983 trip. 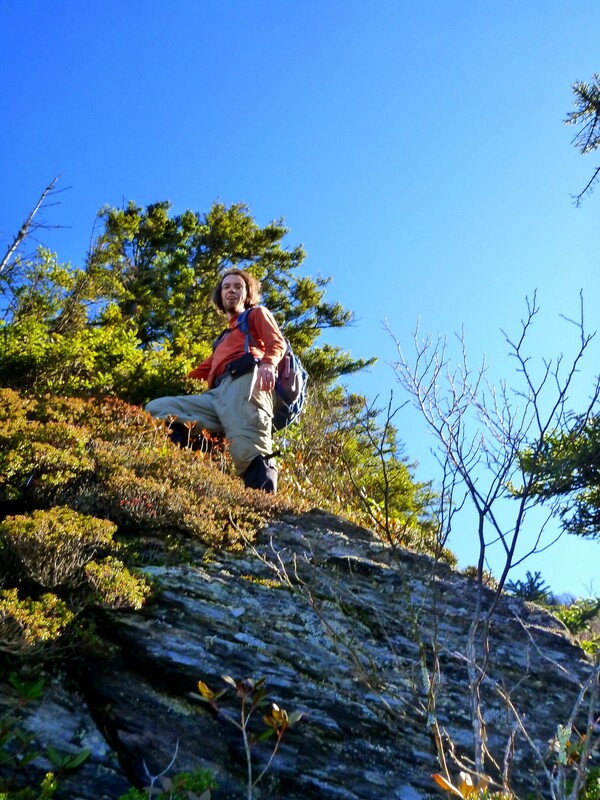 Because we climbed more of the ridge and less of the stream, we had more vegetation to go through. 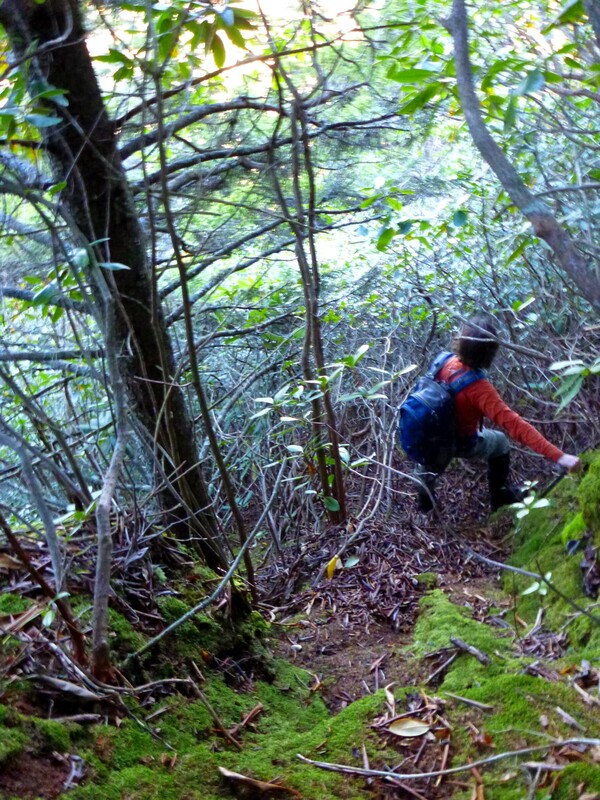 It was slow in places as we crawled through laurel and rhodo. 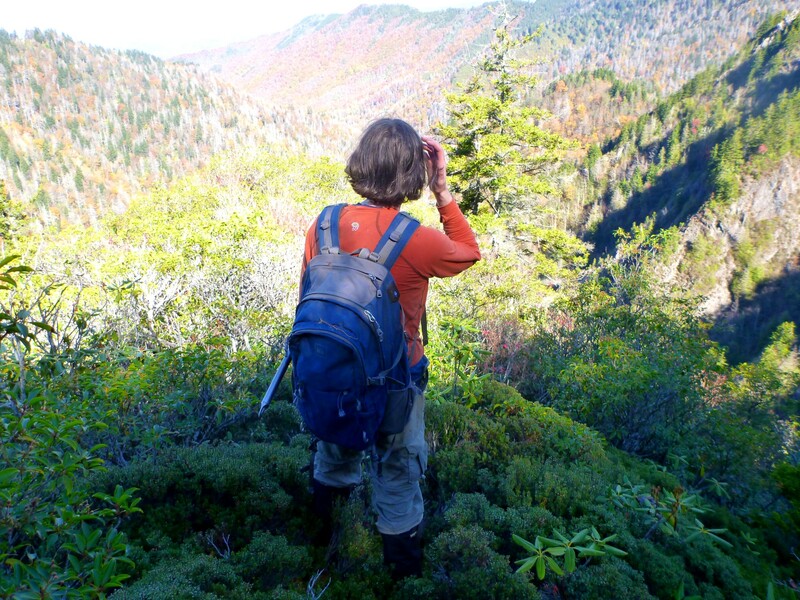 I didn’t recognize the exact place where I’d hit the ridge in the 1983 trip, but I came to realize that the vegetation had grown up quite a bit in those nearly 30 years—no big surprise. After all, the ridge had been entirely bare after the great fire of the 1920s, and things are always in flux. 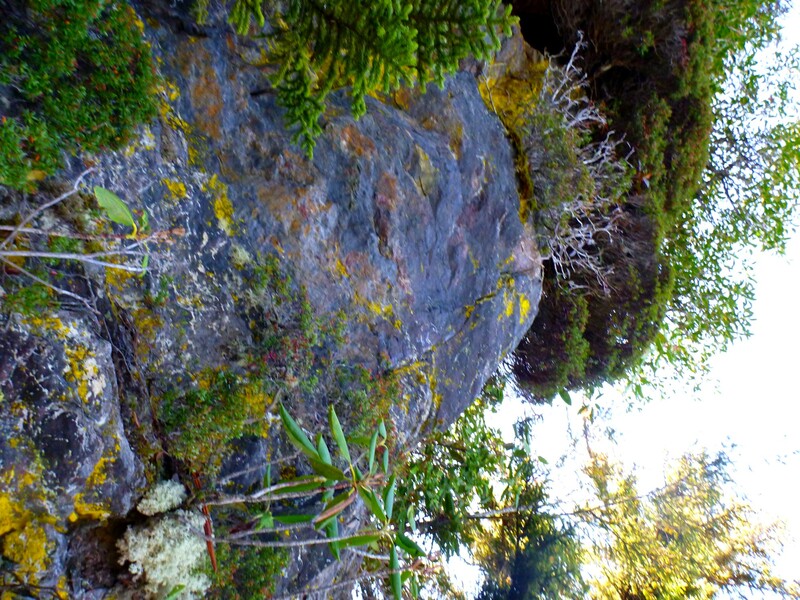 We passed through a rather peculiar zone of dead rhododendron surrounded by tall spruces and finally started coming out onto open rock. 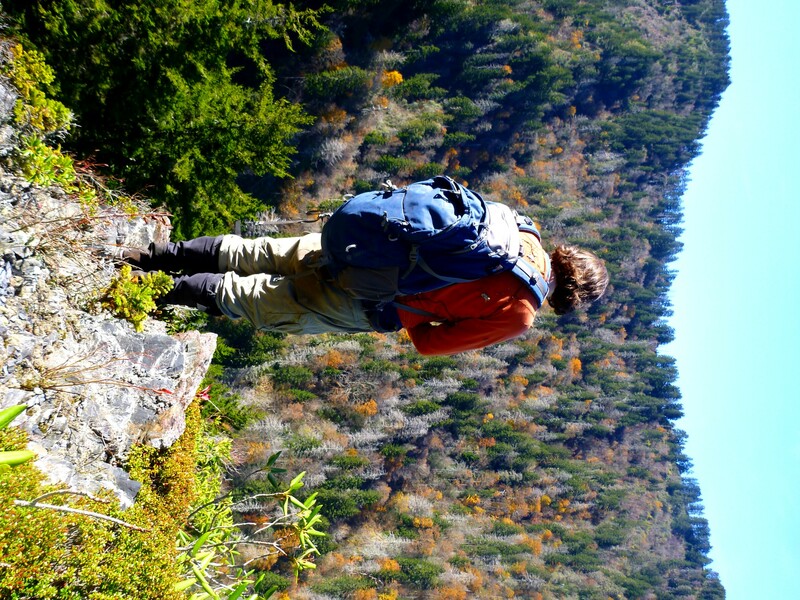 Chris looks over toward the Horseshoe Mountain ridge. One of many stairstep ledges. I found myself doing the same thing I’d done years back, which was to focus on the immediate problem before me, figuring out where to place hands and feet. 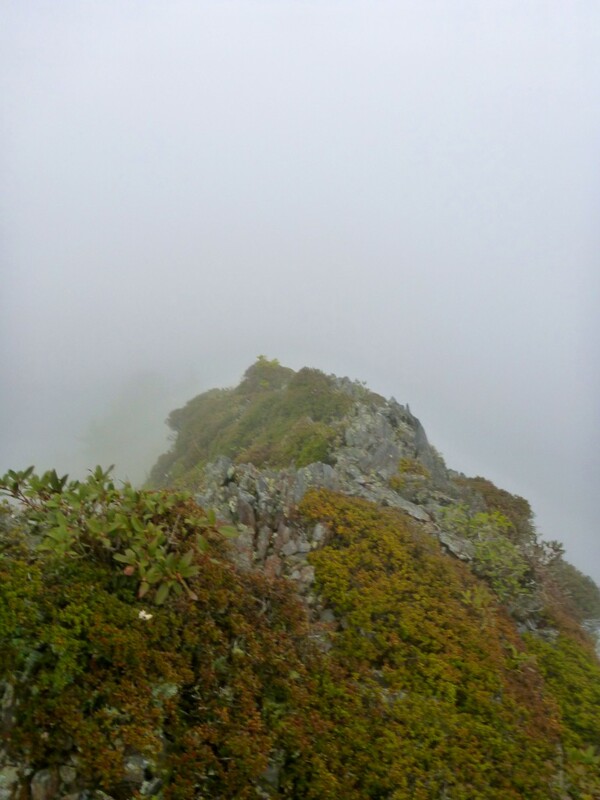 By narrowing my vision, I was able to think about “what is there”—the ample handholds and footholds offered by the ridge—rather than “what is not there”—all the great gaping space that lay just off to the sides. 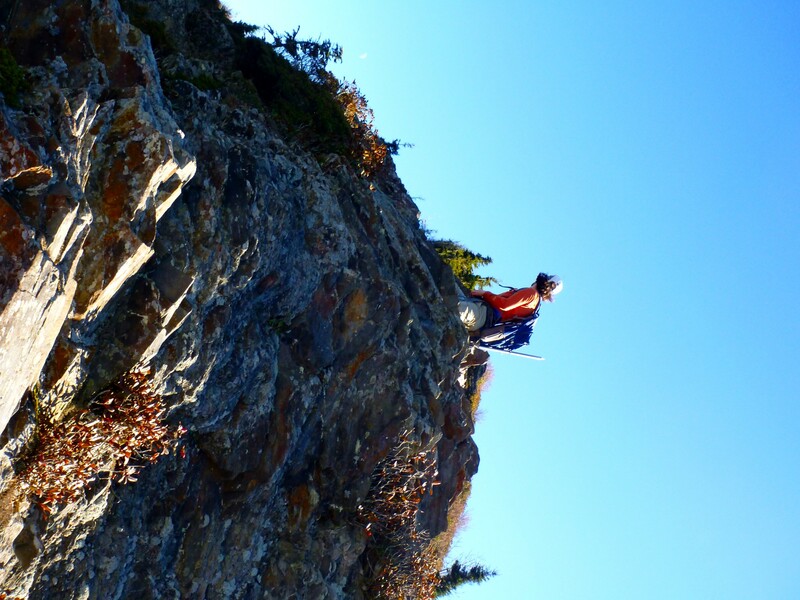 Doing this climb consists of positive thinking in the most literal, concrete sense. Chris tackles one of the bluffs. At last we heard the voices of tourists, and we arrived at the top. As has happened on other similar occasions, the folks sitting on the rock did not immediately understand where we’d come from—they seemed to assume we’d just been doing a little scrambling a bit below. 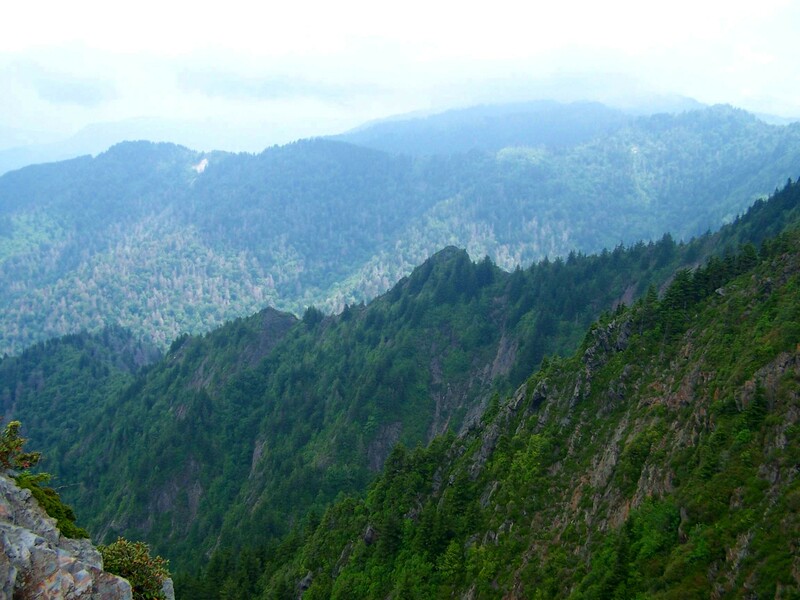 When one of them spoke of the tough hike out from Newfound Gap, my immature side came out and I couldn’t resist telling them that we’d come from the bottom. We explained how we’d gone down Middle—pointing over to that ridge—and come up just below. I knew, however, that they could not possibly understand. “Was there a path?” one of them asked. No, there was not a path. Chris has reached the tourist overlook.